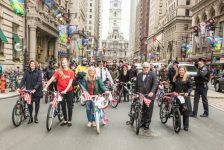 We talked with Bina Bilenky, the Event Director for the Philly Bike Expo. With a dad who is a framebuilder, she’s been surrounded by bicycles her entire life. After receiving her Bachelors degree in Recreation, Park and Tourism Sciences at Texas A-M University in 2010, she’s been working on the Expo ever since. She says, It is definitely a labor of love and we are excited to see it grow each year. Keeping our fingers crossed for good weather this year! The Philly Bike Expo is now in its 4th year. For those who aren’t quite sure what it is could you describe the event? The Philly Bike Expo is a celebration of all things bicycle. Bilenky Cycle Works started it in 2010 to promote cycling culture. We strive for a something-for-everyone atmosphere at the two-day event. We have 90+ exhibitors of custom frame builders, large bicycle manufacturers, accessories, apparel, and components. We also have exhibitors from cycling advocacy organizations, bike shops, clubs, and anything else that promotes a healthy lifestyle and sustainable planet. We always offer a full track of seminars that cover topics such as advocacy, technical, history, and culture. Some seminars we are excited about this year include Women’s Bike Fit and Design by Georgena Terry, Schwinn Paramount: Handbuilt Legend by Richard Schwinn and The ABC’s of Family Biking by Diana Owens Steif of the Bicycle Coalition. Diana will have panelists participating in the seminar who are parents that have integrated cycling with their children into their daily life. You can check out the full seminar line up here. We have almost 20 seminars on the schedule! The Expo is moving from its previous home at the (beloved) 23rd Street Armory to the Pennsylvania Convention Center on Arch Street. What are the biggest challenges with the change, and what are the biggest advantages? The biggest challenge is always the learning curve  just getting used to the new space and how things are done. All the details that get ironed out after years in the same venue become new things to troubleshoot. The biggest advantages are the location and the space itself. The Pennsylvania Convention Center is right in Center City and accessible by multiple modes of public transportation. We are right next to the Reading Terminal Market. Yum! The PCC is close to a lot more hotels as well which is great for exhibitors and out of town attendees. We have more space with the new venue as well which leaves room for demos and activities in the exhibit hall. There will be food trucks and seating in the exhibit hall as well! The other awesome advantage is that our seminars will now be in the same venue just down the hall from the exhibits! What are some of the most exciting things we have to look forward to this year? We will have gold sprints in the demo area presented by R.E.Load Bags and the Philadelphia Bike Messenger Association. The winner will receive a custom R.E.Load Bag and proceeds go to the Bicycle Messenger Emergency Fund. Mary Elizabeth from ALLONEWORD fine cycling caps will be making hats at the Expo and there are multiple raffles going on at exhibitor booths. Massage Envy will be doing 10 minute chair massages and we will have a vintage Schwinn Paramount gallery. There is new artwork this year which means a new poster and t-shirt design! Jeff Williams is the artist and will also be exhibiting at the Expo. We will also have book signings with Bike Snob NYC, Steven Rea, Molly Hurford, David Herlihy and Kurt Boone. More info here. We have some rides lined up as well! Who is sponsoring the event this year? So many amazing companies you can see on our sponsor page! And we thank them so much for their support! The fashion show has always been a highlight of the Expo. What’s new with the show this year? This year we are doing something brand new! Hardcourt Couture: Bike Polo Meets Cycling Fashion. Saturday evening we will have a live polo tournament and fashion show case. Each polo team (made up of members of the Philadelphia Bike Polo crew) will be wearing apparel and accessories from a different company. Designers participating include: JL Velo, N.Bidlake, Sommerville Sports, Bern Unlimited, Chrome Industries and Nutcase Helmets. Blue Moon Brewing Company is the exclusive brewery of the event and will be providing beer for the evening. There will also be food trucks, a DJ and audience participation such as half court shots for a prize. Its the party of the season and admission and beer is included with your Expo wristband. The event starts at 7PM on November 9th and is being held at the 23rd St Armory at 22. S. 23rd St.
Tell me about the indoor valet bike parking this year. How is that working, and where will folks roll up to with their bikes to have them parked? Another plus of the new space is that we can have indoor bike parking! Great news for everyone, but especially for the Neighborhood Bike Works volunteers who have braved the elements in past years! The bike parking is sponsored by Fuji Bikes and provided by Neighborhood Bike Works and will be located in the Broad Street Atrium (the lobby area outside Exhibit Hall G). You can access Hall G and the bike parking at the Broad and Race Streets entrance. I understand you have some big travel adventures planned after the Expo. Could you tell me a bit about that? Starting in the beginning of January my husband and I will be staff for Tour d’Afrique. We will be cycling from Khartoum to Cape Town and camping along the way. It takes about 4 months and will be one heck of an adventure. I’m currently having a bike built by my dad (framebuilder, Stephen Bilenky) that is both light, durable and versatile enough to handle the tough and varying terrain. Tour d’Afrique will be joining us at the Expo and screening the full length film Where Are You Go which was filmed on Tour d’Afrique’s flagship African tour. You can check out the trailer here. Consider joining me for a stage or the whole tour!